1098-C forms can be keyed in or imported from text files, spreadsheets and IRS transmittals. 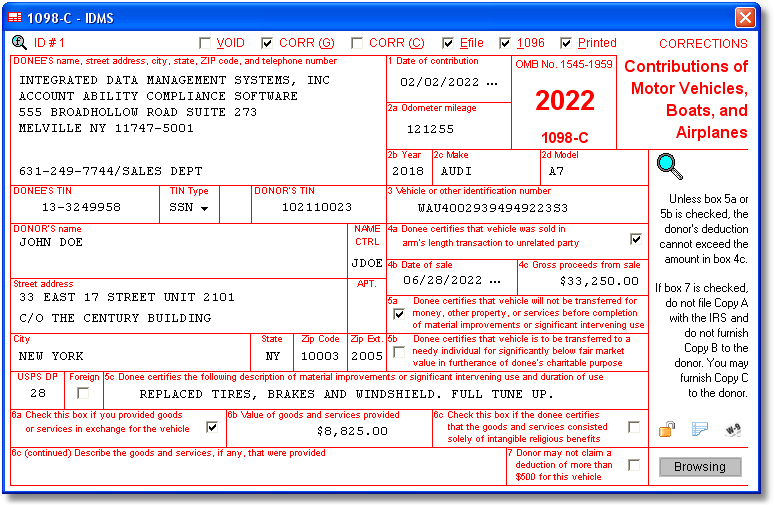 1098-C forms are easily maintained on user friendly windows resembling the actual IRS form (as shown above). Duplicate VINs can be suppressed while importing donor information. Prints a detailed Control Report by Date of Contribution and/or Date of Sale for any reporting period. Free 2019 overlays enable you to print and maintain 1098-C forms for 2019. Bulk TIN Matching module (included for free) checks Donor name and TIN against IRS records. Electronic filing (E-FILE) of tax form 1098-C via IRS FIRE is included for free. Prints 1098-C Copy A on pre-printed fillable IRS approved 1098-C forms. Prints Donor copies on blank paper (see SAMPLE OUTPUT below) or fillable 1098-C forms. Exports 1098-C forms to CSV text files compatible with Excel. 1098-C forms can be rolled foward from year-to-year at your option. Supports an unlimited number of 1098-C returns. Filters unwanted 1098-C forms in seconds. Displays IRS 1098-C reporting instructions and filing due dates. Donor comments, visible only to the filer, can be added to any 1098-C return. Donor copies can be delivered via Account Ability's optional Print and Mail Service. All of your 1098-C forms reside on your computer (or network), not ours. Shop for 1098-C forms and envelopes.